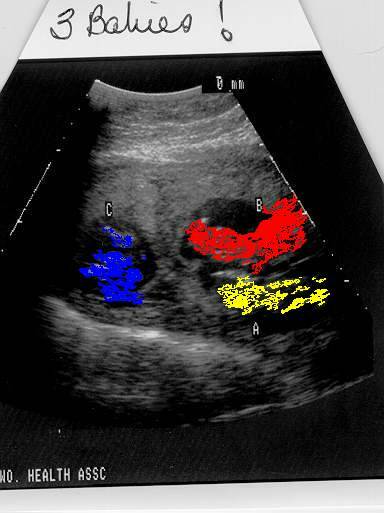 The unretouched photo shows three sacs and three fetuses, at about 13 weeks gestation. The color enhanced photo merely demarcates the three with colors. Without realtime, live imaging, it's hard to make sense out of these photos (see schematic). As the pregnancy progresses, larger, more readily-identifiable images will be available. Mother presented to my practice as turned over to me by her infertility doctor. Usually infertility subspecialists will keep the newly pregnant patients until the end of the first trimester. Above is one of the ultrasound pictures. This served as her initial visit to me, at which time I gave her a general overview of what special problems triplets would pose for her. Because there is just so much more pregnancy happening to her, she's at greater risk for pregnancy-induced hypertension, gestational diabetes, premature labor, placental abruption, and the need for bedrest--if not hospitilization--from about 24 weeks gestation onward (the third trimester). 2)Close observation of the fetuses every two weeks for now and weekly during the second trimester--all with ultrasound to document appropriate growth, absence of discordancy, absence of placental problems, and measurements of amniotic fluid. 3)Close observation of the mother every two weeks for now and weekly during the second trimester--checking weight gain, fluid retention, blood pressure, checks of the urine for spillage of sugar and protein (a sign of pregnancy-induced hypertension, formerly "toxemia"), and second trimester screens for pre-term labor, gestational diabetes, and group B beta-strep.